As soon as I heard of the death in a 'car crash' of Michael Hastings in Los Angeles I set up a horoscope of the tragedy (June 18, 2013 at 4:30 am PDT; source: news reports) and saw that signatures of mayhem were afoot. Since then I've been on alert for information on what entity or issue he was researching because the info might turn out to be full of clues as to the How, Why, Where, and Who of this very sad matter. Known for his game-changing Rolling Stone article on General Stanley McCrystal--The Runaway General--Mr. Hastings was a fearless truth seeker of the sort that no power manipulator tolerates for long once their revelations become too inconvenient or interfere too deeply in The Power Game. 'Naming names' is a dangerous business in the power-mad world of Politics. News Update 6.20.13: police don't suspect any foul play and await results of a toxicology test. 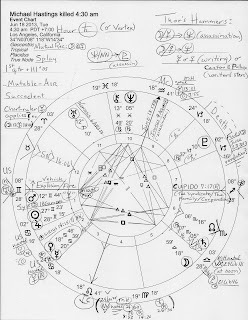 Below, you see the 'crash' horoscope with US natal Uranus 8Gem55 rising (our nation's 'totem' planet of revolution and rebellion) along with transiting Mars @12Gem44 with Gemini being the sign of traveling Mercury and of writers and journalists. 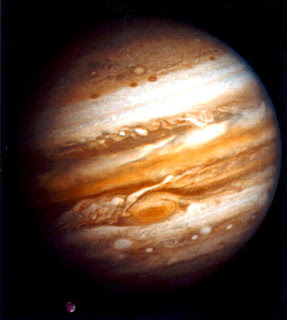 Sun and Jupiter are rising as well and are about to conjoin in their yearly meet-up which may indicate a promise of sunlight cast upon someone of a Jupiterian nature: generals, politicians, bankers, religious leaders, professors, etc. It's an Hour of controlling Saturn (stoppage; loss), plus, in the transiting 2nd house (National Treasury and Earning Ability) are Mercury the Scribe or the Messenger still within orb of vengeful Venus, with both planets stimulating the starry Gemini Twins, Castor and Pollux--each with writing and creating talents of their own. However, transit North Node (NN) was pointing to 18Cap45 (NWO's Uranus/Neptune Conjunction degree '18Cap') the weekend of Casolaro's death by deep wrist-slashing...a similar mode of death as UK's nuclear expert Dr. David Kelley's mysterious 'suiciding' of July 17, 2003--when tr Chiron (The Wound) was at 14Cap37, conj tr Neptune-Pluto midpoint - at the same degree of tr Neptune during Casolaro's last weekend in Martinsburg, West Virginia. This is 3 degrees past the UK's natal Sun and opposes the US natal Sun, the two players with the most to gain from Dr. Kelley's demise. So did Michael Hastings and his reporting 'fly too close to the Sun'? Asteroid Icarus may say, Yes, especially since it represents an archetype that may be used to signify assassination. 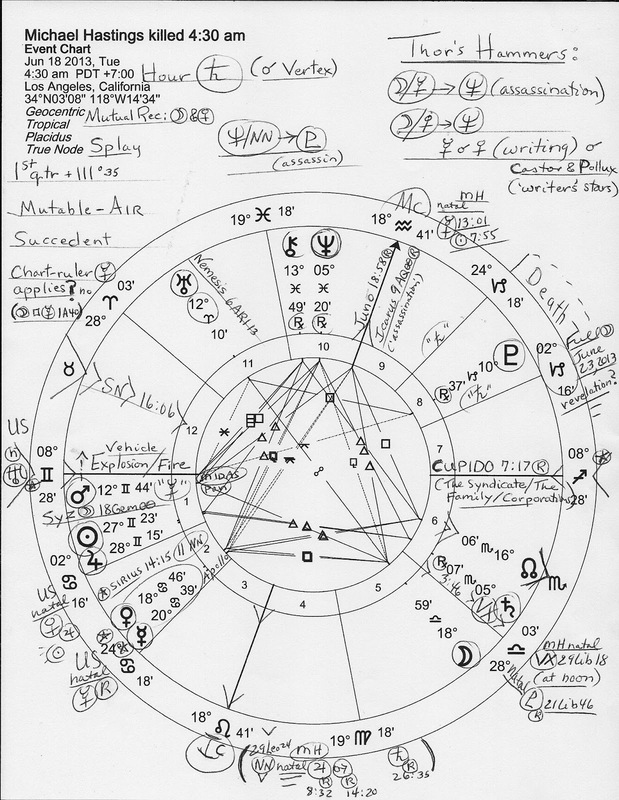 Here I've penned in the asteroid's position @9AQ00 Rx in the 9th house of Publishing, and outside the chart, the natal placements of natal Sun 7AQ55 and Mercury 13AQ01 of Michael Hastings, born January 28, 1980 ('noon' EST) in Burlington, Vermont. Therefore, natal Sun-Mercury = June 18, 2013 Icarus. Getting back to the chart's Ascendant @8Gem28 (the event itself), we know that combinations of Mars-Uranus signify explosions and fires (and fast traveling), and at Ascendant the pair denotes those who find pleasure in upsetting others, abusive people who impede one's progress (ex: assassination), acts of violence, accidents, upsetting events, physical injury, and/or arrest. The 18 North Pre-Natal Eclipse Saros Series of Michael Hastings indicates that accidents and physical injury are themes in his life (he covered wars in Iraq and Afghanistan and lost his fiance there in an explosion.) 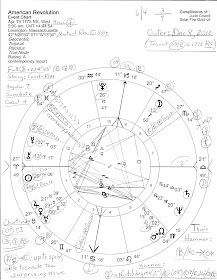 And here we see that the chart's Hammer/s of Thor (or, Fist/s of God) point to the 10th house Neptune @5Pis20 Rx (conjunct President Obama's natal 1st house Chiron Rx), a planet associated with death and assassination as is Pluto @10Cap37 Rx in the 8th house of Death and Transformation. Well, there are more chart factors to discuss yet I must mosey for now. Watching his car burning reminds me of the Illuminati's 'eternal flame' of assassination, a possible implication that I despise with every fiber of my being. 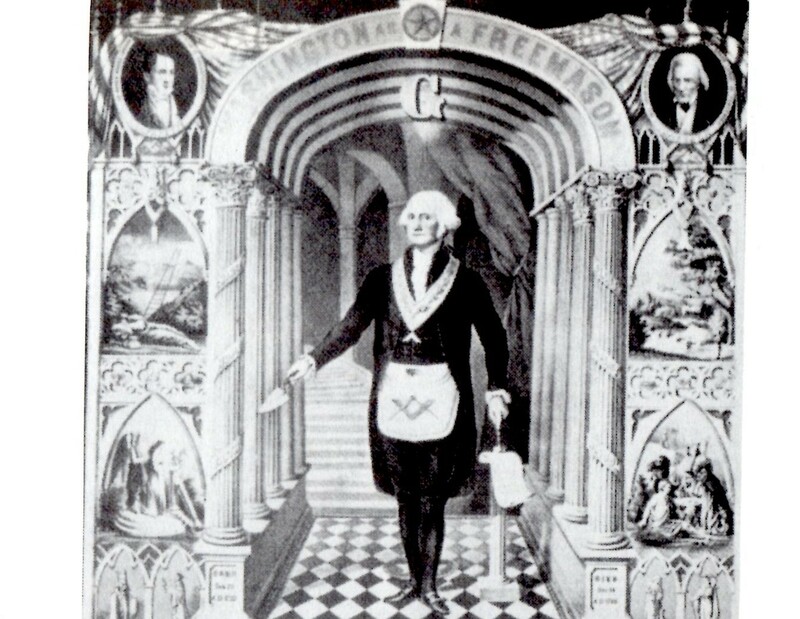 Yes, this is a post I had hoped would not be necessary but the video above made me determined to record some of the astrological portents concerning the untimely, cruel death of truth-finder and American patriot, Michael Hastings. I hereby thank him for his valuable service to our nation. May he R.I.P. Historic events of June 18.